Variable Speed pumps combine variable drive technology, on-board digital intelligence, and permanent magnet motors (used in hybrid cars) to reduce pump-related energy costs by up to 90%. Traditional pool pumps with induction motors run at only one or two speeds and consequently drawn more energy than is required to circulate pool water. Most variable speed pumps have the ability to be programmed to operate at customizable speeds that can deliver the correct amount of flow for each task they perform, such as running a bottom cleaner, spa jets or a water feature. There are a few different variable speed pool pumps out there and we highly recommend pumps from Pentair and Hayward. Both companies have earned energy star certification and have proven their superiority in energy efficiency. 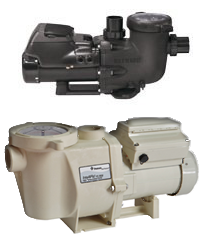 Pentair offers two variable speed pumps, the IntelliFlo VS (Variable Speed) and the IntelliFlo VF. Hayward’s popular variable speed pump is called the Eco-Star. No matter what kind of variable speed pool pump you choose, slower pump speeds save energy. In addition they significantly reduce the noise level associated with traditional pool pumps and reduce wear on not only the pump itself but also on filters, heaters, chlorinators and other equipment that water flows through. SDG&E also offers rebates on the purchase and installation of select variable speed pool pumps and controllers. Feel free to contact us for more information about energy efficient pool equipment. We can tailor energy efficient pool equipment for any situation to help save you money and help the environment.